Frank Stella was adamant. Despite several entreaties from fellow artist Bernar Venet some years ago, the painter declined to make a piece of jewelry for Venet's wife, Diane, a collector of wearable works of art. "He was not interested," says Diane. In 2009, however, Stella arrived at the couple's home with a flowerlike wire necklace—and so joined a cadre of celebrated talents, from Georges Braque to Louise Bourgeois, who have explored personal adornments, either fabricating the objects themselves or farming out production of their designs to craftsmen. This pocket-size corner of the art world is having its moment. 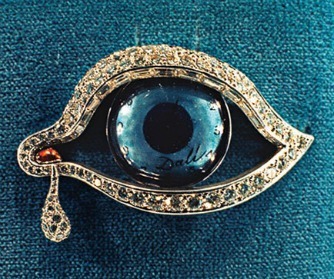 In the past two years, institutions across the globe have showcased the genre; the Museum of Arts and Design in Manhattan is currently hosting "Picasso to Koons: Artist as Jeweler" (through January 8), guest-curated by Diane Venet and featuring 187 treasures, among them a 1949 Salvador Dalí brooch shaped like a crimson mouth and encrusted with rubies (for the lips) and pearls (for the teeth). And hot on the heels of a wildly popular traveling exhibition of Alexander Calder jewelry, a 1939 Calder brass necklace sold for $602,500, a record for the artist's jewelry, at Christie's in New York last May. "A lot of people who want to own a Picasso can't buy a painting, but they can buy his jewelry," says London dealer Louisa Guinness, who sells designs by Picasso and British sculptors Tim Noble and Sue Webster, among others. The Spanish master's limited-edition medallions, fashioned by goldsmith François Hugo and worn as pendants or brooches, sell for $15,000 to $20,000. Anish Kapoor's sculptures run into the seven figures, but his rings fetch less than $10,000. And Damien Hirst's charm bracelets, hung with 23 different pills cast in sterling silver, are priced around $18,000. The best of these pieces aren't simply scaled-down sculptures or paintings, but something new from "individuals who rose to the occasion," says Kelly H. L'Ecuyer, author of Jewelry by Artists: In the Studio, 1940–2000 (MFA Publications). Though some artists readily conceived jewelry for lovers or friends, others have needed some convincing that such creations are worth their while. Milanese goldsmith GianCarlo Montebello successfully persuaded the likes of Lucio Fontana and Niki de Saint Phalle, offering their concepts under the Gem Montebello label. They are coveted classics now. For her part, Diane, with New York City dealer Sara Benda, has coaxed an edition of ten gold rings from Stella. "He won't do any more," the collector says. Get them while they last. View a slide show of several artists' jewelry pieces here.